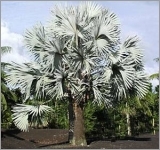 Hyophorbe verschaffeltii, the Spindle Palm, is native to the Mascarene Island of Rodriguez. 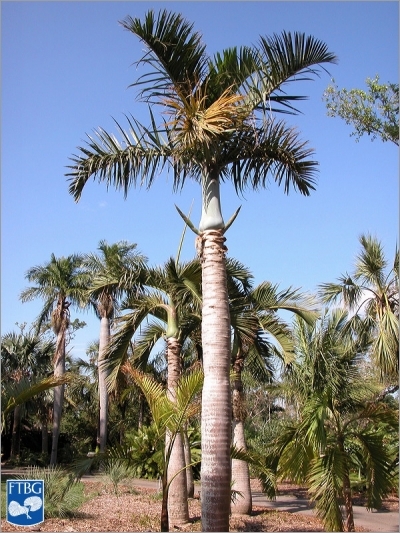 This Palm does well in tropical areas as well as sub-tropical areas and grows to 14-16 feet tall. A unique, different and popular palm that should be part of any collection. Easily grown in containers and make an excellent specimen to show off. Wonderfully unique Palms that look like similar to their cousin the Bottle Palm but trunk is not as swollen. The base is colored cement gray and is swollen and narrows towards the crown. It grows in the shape of a spindle, hence the name. The crown consists of 6-10 pinnate leaves which arch outward forming a 'V' shape. The leaves are 9-10 feet long and have 100 to 150 leaflets that are bright green above and gray below. The fragrant flowers emerge ivory to orange in color. Flower stalk coming from just below the crownshaft, 2.5 feet long. There are separate male and female flowers on the same inflorescence. The fruits are 3/4 inch long and orange to red in color.